The insulin activity in pregnant woman is reflected in the newborn, according to a study published in the September 20, 2012 issue of Acta Obstetricia et Gynecologica Scandinavica. The study included 41 women; half with gestational diabetes and half with normal glucose tolerance. All women were given a 75 gram oral glucose solution via a glucose tolerance test. 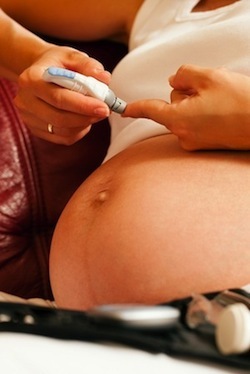 Maternal and newborn cord blood glucose levels were measured. Women with gestational diabetes showed increased levels of blood glucose and plasma C-peptide, while women in the normal glucose tolerance group did not. Cord blood samples showed parallel rises in blood glucose and plasma C-peptides in the newborns of women with gestational diabetes. Researchers from Laval University Medical Research Center concluded that secreted insulin activity in the newborn reflects that of the mother. Newborns born to the normal glucose tolerance group measured normal glucose levels and newborns born to the gestational diabetes group measured elevated glucose levels. Source: Dubé MC, Morisset AS, Tchernof A, Weisnagel SJ. Cord blood C-peptide levels relate to the metabolic profile of women with and without gestational diabetes. Acta Obstet Gynecol Scand. 2012 Sep 20. doi: 10.1111/aogs.12005.